With the help of our donors, corporate partners, and supporters, The Crayon Initiative exceeded expectations in 2017. By year-end, we’d packaged and shipped over 37,000 packs of crayons to Child Life programs in children’s hospitals across the country. At a 1:1 ratio of one pack of crayons to one child, that means we’ve brought smiles back to the faces of 37,000 kids fighting for their lives. But we want to do more in 2018. Child Life programs experience an ongoing shortage of art supplies which they use to enhance pediatric healthcare. Child Life Specialists often monitor their patients’ art projects to assess how well they are coping with their hospital experience. But without the resources, their efforts are hindered. The Crayon Initiative fills this void by shipping boxes of 8-pack ergonomically shaped crayons right to their door at no cost to them. With our current volume of raw materials, we are on track to produce 250,000 packs of new crayons in 2018. That’s 250,000 kids who get their very own brand new box of crayons that give them something familiar to hold on to in a very an unfamiliar place. Kids like Evan. At 8 years old, he already has his mind set on taking the top job at the White House and Abraham Lincoln is his hero. In his mind, there’s nothing he can’t do, including beat kidney failure. A two-times kidney transplant recipient, Evan has spent many days of his young life in and out of the hospital. While he faces multiple congenital abnormalities, in Evan’s mind, he’s an average kid with big plans to change the world and nothing’s going to get in his way! For many kids living with chronic diseases, going back and forth to the hospital is no fun. 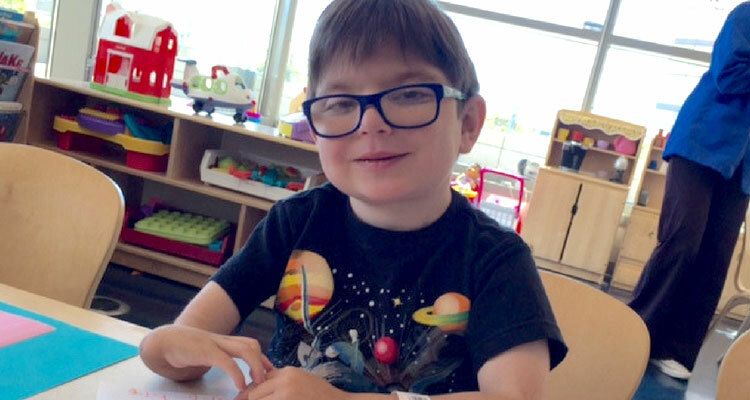 While their friends are playing on the playground, kids like Evan, are being hooked up to medicines that save their lives but dampen their spirit. 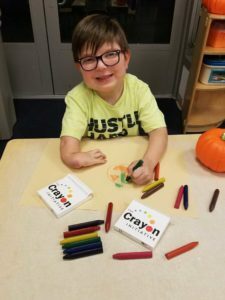 Creating art with The Crayon Initiative crayons has helped thousands of kids feel in control during a time when they can’t control what’s happening. On coloring, Evan says, “It’s kind of my favorite thing to do. I like drawing stuff and being creative. It helps me think about fun things.” When he’s away from home, what a comfort it is to spread out a palette of colors and make a picture of someplace fun. Please continue sending us your crayons. Our program guides have various ways you can collect crayons and send them in to us. But, in 2018, we also ask you to consider taking it a step further by making a financial contribution as well. We don’t sell our crayons for profit. In fact, we don’t sell them at all. Our crayons go directly to hospitals for the benefit of the children at no charge and that’s never going to change. But we need your help to do this. From individual donations to corporate sponsorship, we have several options available for you to give. Together, the sky is the limit on how many kids we can share the gift of art and imagination with.